The evening started with conversations among attendees at tables around one or more questions related to issues of racial profiling, white supremacy, carding, identity, etc. There were prepared questions about the responsibilities of white people in overcoming white supremacy. There were questions about racial identity and social engagements with identity. Before Cole spoke, singer-songwriter Desiree Dawson sang several of her original songs including CBC Searchlight winner from 2016,”Hide.” Dawson proved popular with the audience who responded enthusiastically. 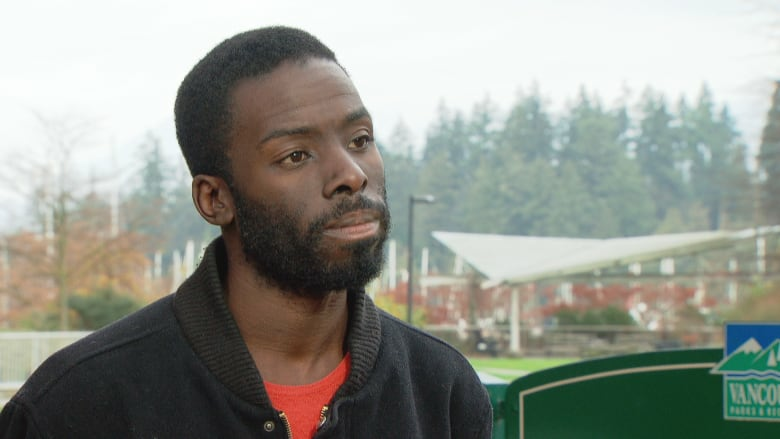 In an honestly emotional start, Desmond Cole began by relating his disturbing experiences of being carded by Vancouver police within 24 hours of his arrival in the city. Cole did say that the Vancouver Police Department denied they do racial profiling or even have racism on the force. Yet their own data show that while one percent of Vancouver’s population is Black, they are five percent of those carded. While Indigenous people are two percent of Vancouver’s population, they are 16 percent of those carded. And police had denied for years that this data even existed. Cops lie. Cole asked people to think about the challenges that brought us together as communities on the evening. These were perhaps questions about what it means to be Black in Vancouver or Canada today. Maybe simple curiosity. Cole asked why people where there and what it is about communities in struggle that makes them want to attend events like this—which do not happen all the time. There were many thoughts conveyed on the immense strength it takes for people to get up and into the world—given all that is going on today. Self-care and care of those around us was recognized to be essential. Desmond Cole stressed that this is work that is often not looked at as The Work (capitalized) of movements. But Cole said finding time to laugh, and laughing, is The Work too. Cole spoke of his upbringing in Red Deer (which surprised many) and Oshawa and his increasing appreciation for nature. Anyone who follows Cole on social media knows that his journalistic and political posts are often joined by lovely photos of flowers. Sadly, this is what he was simply trying to enjoy when he set out for Stanley Park and was stopped by the Vancouver Police Department officer. One highlight of the discussion was Cole’s discussion of what he calls “White Supremacist Improv.” This involves white people making up rules that Black people have supposedly violated , as a means to keep them in their place. So white people online made up or looked for absurd bylaws that Cole must have violated for the cops to have stopped him. It could not have been, according to the white supremacist improvisers, that the police are a racist institution or practice racial profiling. A key point stressed by Cole is the need to stop incrementalism and middling approaches to social change (that do not really change anything)—and go directly for what is needed. Cole emphasizes that Black people have the right to demand what they need on their terms. It is not impractical or unrealistic to demand what is necessary for justice. Indeed, as Cole puts it, there is nothing more impractical than believing that white supremacist systems will recognize their inequity and decide to do what is right for Black people. Relatedly, the law, is fine not protecting Black and Indigenous people. Cole noted that police street checks are violations of multiple Charter rights. The Charter is not for Black people. It was made despite their needs. Everyone has the right not to be arbitrarily detained. Everyone has the right to be free from reasonable search or seizure. White supremacy tells people that police acting other than they do would be unsafe. Black and Indigenous people are viewed as criminals in the making or as potential criminals. Legal systems allow many, predominantly white people, to make money building, staffing, filling the prisons and prison structures. It is a system of accumulation. In response to a question from an attendee, Cole noted that police discretion could be exacerbated under the new cannabis regime. Stops could bee based on smell, red eyes, etc. Impairment is supposed to cover being tired, using legal substances, etc. How is and will it be applied. Historically, along lines of racial profiling. A Road Map to Abolition? Cole is clear that he is a police and prison abolitionist. He suggests that we need a road map to get to abolition and has three initial steps as related to carding. First, cops should tell people their rights up front. Cops could articulate the law to people-not make people guess what their rights are and certainly not deceive people about their rights. If any police officer cannot do that they do not get to perform that role (either as a cop or as whatever role might replace cops). Second, police should not keep records on innocent people. Where cops are replaced with something better there might be reasons to document caregiver or safety patrol interactions with someone. But they should be given receipts with details of where they can complain and on what grounds. For Cole, current cops should give you a receipt with badge number any time police interact with you. It should say why they interacted with you. Carding is for non-criminal behavior. It involves information on people who have not been convicted of acts involved in the stop. Does the RCMP have the information also? Does CSIS? CSEC (the secretive intelligence service in Canada)? Who do the VPD share it with? We know that information from police encounters in shared with police forces in other countries. Any of us travelling to the United States knows this. Third. Police should have no control of those contact records. Cole noted that the officer who stopped him was alone driving a car with expensive equipment and weaponry. To do what? To enforce a non-existent smoking bylaw? That is a massive waste of public resources. And all of the funding for those resources could be better spent caring for people and communities. That is a point that abolitionists make. Policing drains public resources mightily while impeding efforts at social care and solidarity. Budgets are wrecked so cops can drive around harassing poor, working class people for doing little of consequence, and routinely inflicting brutal force against us and our communities. On the whole, Desmond Cole took a very conversational approach. He wanted to hear personal experiences and reflections—about anything—from people in the room. There was no formal question and answer session. In closing, he emphasized that the Mayor of Vancouver, Kennedy Stewart, and others in power have an obligation, not to him, as they have tried to apologize, but to the Black communities in Vancouver—the people who live in Vancouver and will be here after he has returned to Toronto. Cole announced that he has a book coming out in 2019, The Skin We’re In.” The focus of the book is on policy practices that disproportionately target Black people in Canada. It will be essential reading for anyone concerned with issues of justice in the Canadian state context.